In Aging in World History, David G. Troyansky presents the first global history of aging. At a time when demographic aging has become a source of worldwide concern, and more people are reaching an advanced age than ever before, the history of old age helps us understand how we arrived at the treatment of aging in the modern world. This concise volume expands that history beyond the West to show how attitudes toward aging, the experiences of the aged, and relevant demographic patterns have varied and coalesced over time and across the world. From the ancient world to the present, this book introduces students and general readers to the history of aging on two levels: the experience of individual men and women, and the transformation of populations. With its attention to cultural traditions, medicalization, decades of historical scholarship, and current gerontology, Aging in World History is the perfect starting point for an exploration of this increasingly universal aspect of human experience. "Aging in World History is a magnificent accomplishment. No one has ever undertaken such an ambitious work, and no one other than David Troyansky could have succeeded. He has brilliantly traced individual experience, demography, culture, and policy across Western and Eastern civilizations, from hunters and gatherers to the present day. Troyansky's grasp of secondary and primary sources is breathtaking. His capacity for balancing darkness and sadness with hope and affirmation demonstrates a wisdom worthy of his subject. Despite Troyansky's vast learning and interdisciplinary range, his gifts of synthesis and storytelling make the book a pleasure to read. It will be accessible to undergraduate and graduate students, policy makers, and to students in the health professions. It should help us all think about our aging society as well as our aging selves." "David Troyansky's work offers a much-needed, concise synthesis of an extraordinary body of work on the history of aging and old age, ranging from ancient to contemporary periods, and across the globe. Few historians would be able to paint such a varied and vivid picture with such a broad brush, but Troyansky expertly balances coverage of comparisons across time and among cultures, while leaving us with a series of nuanced portraits of important individuals and developments. This book, with its frank assessment of the many gaps still existing in our understanding of the history of old age, should provoke new work, while providing a touchstone for the state of the field today." "This unique, global survey of aging throughout history challenges familiar myths and stereotypes: there were always many survivors to old age, and they were not more respected or better cared for by their families in some past golden age or other country. If old age ever had a golden age, it is now." 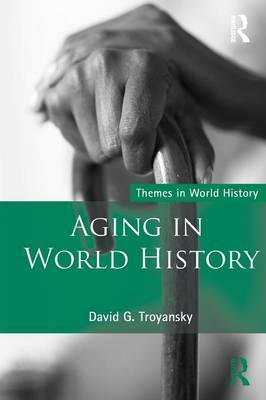 "Troyansky provides a useful historiographic presentation of aging by introducing and analyzing important scholarly works from a variety of disciplines (history, anthropology, sociology, gerontology, etc.). Each chapter also has a list of suggested further readings... Troyansky explains that the history of aging has been studied more in the West than in other parts of the world and has often been tied to national histories. For that reason, this global approach is unique and valuable. Summing Up: Recommended. All levels/libraries."